Anscheinend ist eine Vorabversion des neuen Regelwerks im Internet aufgetaucht. Na da reagiert GW wohl auf die unterbrochene Spielzugreihenfolge von Infinity. Jetzt gibts also auch endlich "Stehen und Schießen" in 40K. Oder eben Sperrfeuer. Klingt interessant und weit weg vom Kiddie-Spiel. Abwarten und Tee trinken, sage ich da immer . Aber die Gerüchte klingen schon mal ganz gut. 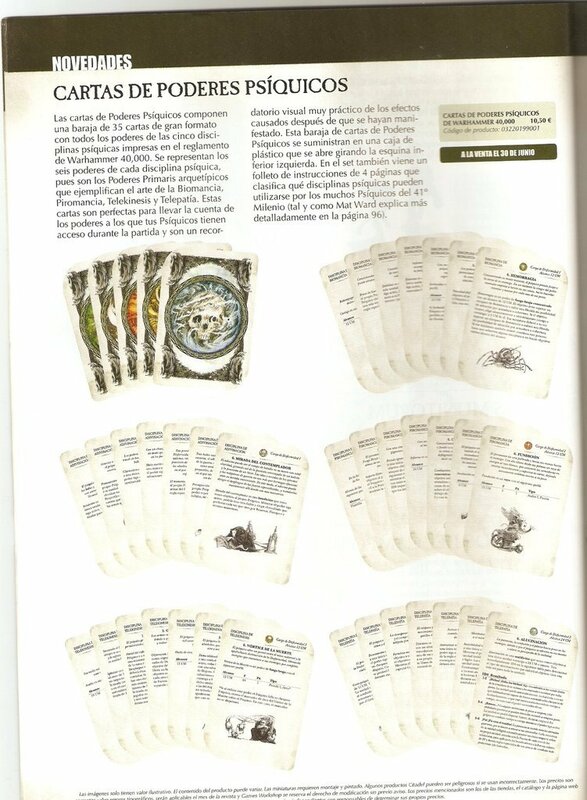 Imperius Dominatus schreibt folgendes: Got this info about the 6th ed leak. It was done on a home edition of the program that GW use the professional version of, this version was 1.5 vs the 1.6 that GW use for all their other (older) published files. The files origin is Glasgow not Lenton unlike all their published files and the file author is named Robert Smithe, not GWPLC like all their other published files. What you guys think about that? I should have known better, but the heat of the moment got the best of me. Typically I get double verification for a rumor or leak, but this time I took a leap of faith and decide to take a risk and capture the moment and jump on the 6th pdf leak bandwagon. So I posted the leak on my site roughly the same time it was appearing on other forums and sites. I even begged the question, “too good to be true”, giving me cover if I was wrong. I wanted to believe, the PDF took some of the best ideas from other games and mashed them into 40k. The biggest clue I should have seen right off the bat. I couldn’t shake the feeling that something wasn’t right. The changes were just so big, the mixing of the phases, evasion to name a few. Still though I just couldn’t image close to 200 pages of FAQs and rules being a hoax. A hoax that big just didn’t seem worth the hassle for its creators. It took 48 hours of investigation, but now I can say that with almost 99% certainty that the leaked 6th ed pdf is a total fake. Now this certainty doesn’t just come from my usual sources, it also comes from other people in the know and trusted confidants. 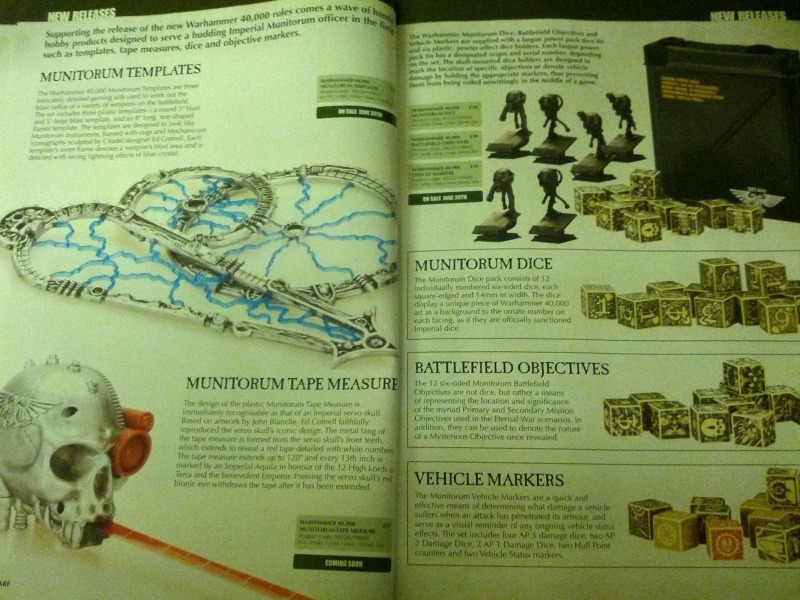 So unless this is some ploy by GW to deflect the leak, I cannot see how it is anything, but a fake. Good thing with rumors and leaks is no one dies and everyone has something to talk about. Who knows I might still give these fake rules a try they certainly look fun. Die aufgetauchten Regeln gehörten in der Tat zur kommenden 6. Edition. Zudem würden sie lediglich einen Teil eines größeren Planes bilden, der schon vor Jahren konzipiert sei: GW wolle nämlich einige Kernregeln entwickeln, die für längere Zeit bestehen und ggfs. mit FAQs usw. erweitert werden könnten. Dadurch befreife sich GW einigermaßen von der stets plagenden Regelnfrage und könne der Modellseite des Geschäfts sowie der Weiterentwicklung anderer Spielaspekte (Wh30k-Ergänzung z. B.) mehr Aufmerksamkeit schenken. Auch interessant ist, dass eine mögliche Weiterentwicklung der 40k-Geschichte geplant sei (worüber ich mich persönlich freuen würde). Egal was passiert, bin ich gespannt, welche Gerüchte, wenn überhaupt, sich als wahr erweisen werden. Es spitzt sich zu: Das Presse-Statement von Games Workshop zum Release der sechsten Edition scheint vorzeitig den Weg aus dem HQ nach draußen gefunden zu haben und gibt Aufschluss über die kommenden Bücher und Boxen. Gleichzeitig gibt es noch mehr neue und interessante Gerüchte zu den Regeln, denen ich mittlerweile schon ziemlich viel Glauben schenke, so kurz vor der Veröffentlichung. Das Datum “23.06.2012″ bezieht sich im Übrigen auf den Release des White Dwarfs an diesem Tag, der dann die Inhalte der sechsten Edition in der Vorschau anpreisen wird sowie den Startschuss für die Vorbestellungen bei GW gibt. There is no time for peace. No respite. No forgiveness. In the nightmare future of the 41st Millennium, Mankind teeters upon the brink of destruction. The galaxy-spanning Imperium of Man is beset on all sides by ravening aliens and threatened from within by Warp-spawned entities and heretical plots. Only the strength of the immortal Emperor of Terra stands between humanity and its annihilation, and in his name, countless warriors and agents do battle against the encroaching darkness. Foremost amongst them stand the Space Marines, the ultimate protectors of Mankind. Across airless moons, within the depths of dark, twisted hive worlds and even in the immaterial realm of Warp space, battles rage that will shape the future of the galaxy forever. 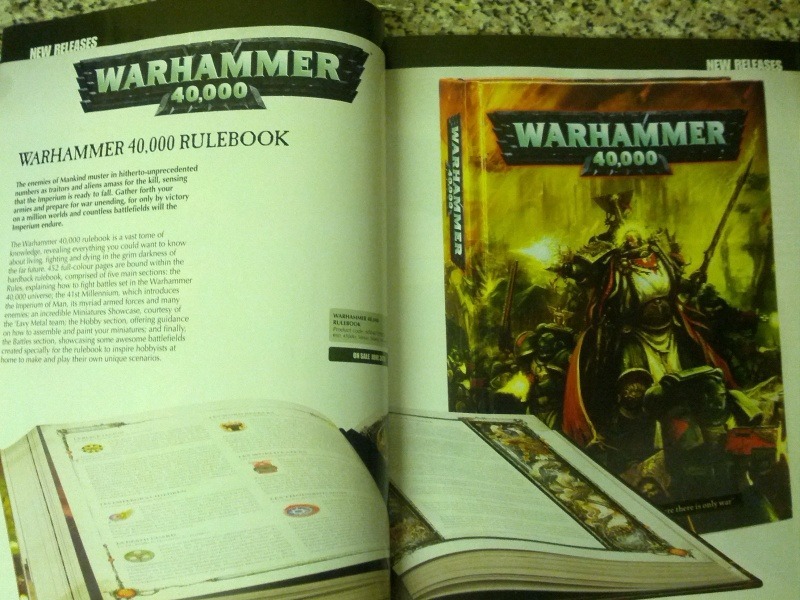 The Warhammer 40,000 Rulebook is your essential guide to playing atmospheric battles in the 41st Millennium. It helps you field majestic armies of Citadel miniatures across the war-ravaged battlefields of the far-future, in the ultimate contest of strategy and skill. With 440 full-colour pages, this hardback Rulebook is packed with rich background and contains all the rules for fighting pulse-pounding tabletop battles. The Rulebook includes exciting features such as dynamic close-combat, flyers, psychic devastation and interactive scenery. As well as jaw-dropping artwork, contained within is a history of the 41st Millennium and a richly detailed guide to the races and weapons of the far-future. It also features a comprehensive hobby section to set you on the path to choosing, collecting and building your own Warhammer 40,000 army of Citadel miniatures. One of the many exciting features of Warhammer 40,000 is Psychic devastation, where Psykers wreak havoc on the battlefield. Psychic Powers is the complete set of Psychic cards, which be used in conjunction with Psychic Disciplines. They make a great accessory to your tabletop games. This set contains 35 large-format cards and come stored in a plastic fan-opening case, which bears the Aquila. There are 7 cards for each Psychic Discipline, each of which is represented by distinct artwork. 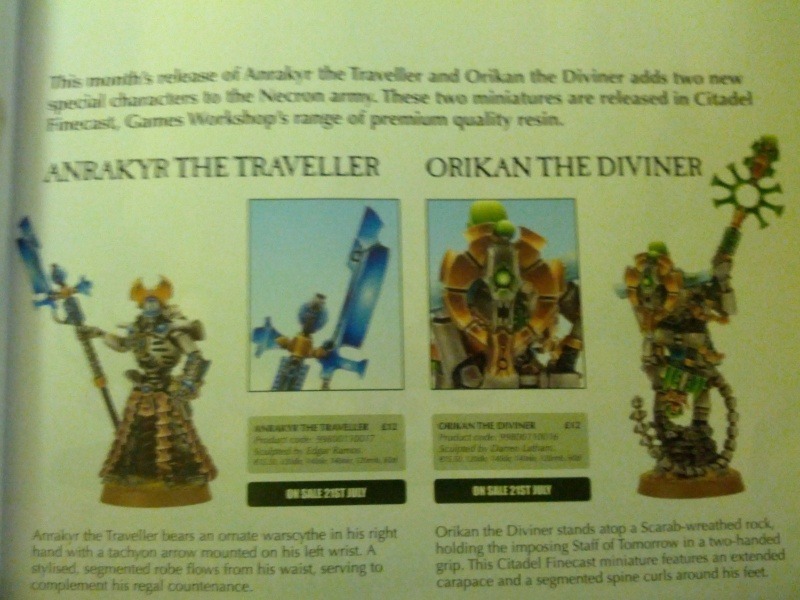 There is also an instruction leaflet that classifies which powers can be used by the main Psykers in the Warhammer 40,000 universe. AP are on ccw but he says power weapons are ap 2, not 3. When you charge it’s double your move, infantry move 6, bikes 8 cav 7 etc. It’s move assault then shooting now! When you shoot you roll to hit depending on the speed of your target. Fast vehicles you always need a 6. A unit can’t claim a object while inside a vehicle. you only do 2 wounds! Strengh (9?) or more would do 3 wounds & kill him. landraider would be worth 5 kill points & a unit of marines 3pts. I did not mistype WS1 for moving vehicles, they are not WS10 if they moved – flyers might be different; not sure. 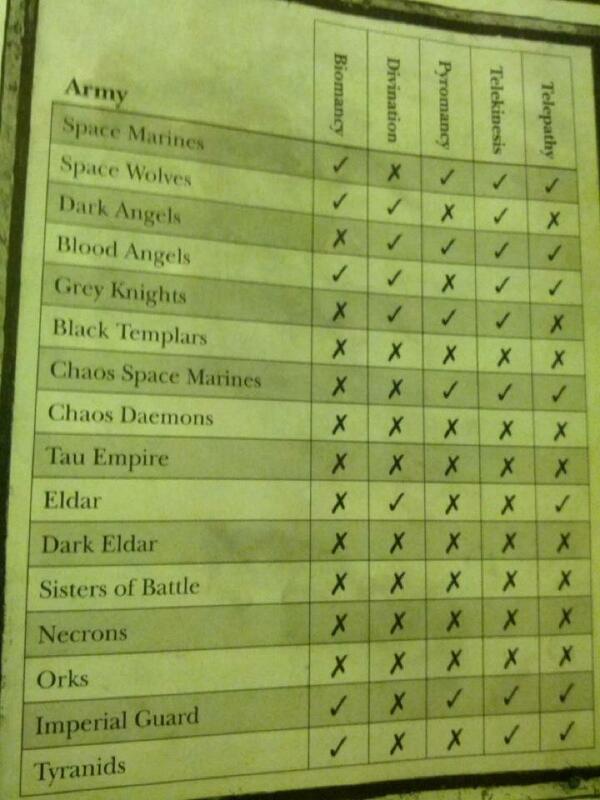 Eldar Flyer, Void Raven and Tau I believe are in the same wave. Vehicles are WS0 if stationary, and WS1 if they move, no matter how far they go. 5+ Cover save for most things including ruins. Wound Allocation is closest to furthest. Rapid Fire weapons may now can shoot at long range while moving. restriction on assaulting after rapid firing remains. Psychic Power Decks using a dice system similar to Fantasy. FNP drops to 5+ Save. "Euer Gott stellt einen Apfelbaum mitten in einen Garten und sagt: "Macht, was euch Spaß macht, Leute, oh, aber eßt keinen Apfel." O Wunder, o Wunder, sie essen natürlich einen, und er springt hinter einem Busch hervor und schreit: "Hab ich euch endlich!"" Warhammer 40,000 6th Edition is mere days away and the folks in the know are finally stepping in to confirm or deny what we'd heard previously. Hullpoints: The previous rumors are true. Vehicles move to the new hullpoints system that will eventually kill them after receiving a number of critical chart rolls. Look for 3+ Hullpoints on most vehicles. Allies are IN: As had been suspected, a new army chart will report the level of cooperation various armies can have. This will not allow cherrypicking of valuable units from another codex, but instead the ability to integrate a second FOC chart into you army from the selected ally. How deep you can develop this second tree (beyond the mandatory HQ and 2 troops) is determined by what level of cooperation the armies have on the chart. Fortifications: The truth exceeds the mission based rumors. Look to find a new "Fortification Slot" on the FOC that all armies can access and use in standard army construction. Surprise, surprise, the common choices available happen to have existing Games Workshop kits already available. - Hull Points are in, it is stated that Ghost Arks, Land Raiders, and Defilers each have 4 Hull Points apiece. Necrons have the ability to strip hull points for each roll of a 6 to penetrate/glance vehicles, making rapid-firing gauss weaponry very powerful at removing armour. - Speaking of rapid fire, you can indeed move and fire once up to the full range of the weapon (it is explicitly stated that Fire Warriors can fire their weapons up to 30″ away), no confirmation on the 3x fire for Relentless at half range though. - Assault moves are indeed 2d6″, but added together. Units equipped with jump packs can re-roll the dice to see how far they charge. - All flying monstrous creatures have the ability to fly 24″, doing something called a “Vector Strike”, which is a certain amount of automatic hits to a unit they fly over, at the base strength of the creature. - Flyers are a specific type of unit, and it is somewhat unclear as to the rules for shooting at them. Either all units require a 6 to hit them (unless they have a special rule called Skyfire), or this is still the case but only if those flyers move flat-out. Monstrous creatures with the ability to Fly also get this “6-to-hit” rule. - You have the ability to buy different terrain (it even has its own slot on the new FOC), e.g, you can buy a Bastion with a Quad-Gun (which has the aforementioned Skyfire USR). There seem to be quite a few options for what terrain you can buy, but naturally most of them are typically represented by terrain kits GW sells. - Now we’re on the topic of the FOC, the rules for allies weren’t laid out specifically, but it is heavily implied that its not the same as in WHFB. They refer to allied units as “Detachments”, and there is an example of a player with a Chaos Space Marine force having some detachments of Chaos Daemons in his army. Basically, I was given the impression that it is far more common (and frequent) for a detachment from another 40k army to join a larger one, than it is for a Fantasy army to have Allies. Think more along the lines of the Storm of Magic rules for using TK, VC, or Daemons. - Here’s a biggie: Units -can- go on Overwatch, giving them the ability to fire upon an enemy unit which charges them, but at BS 1. Eldar (and any other army with access to the Clairvoyance psychic power set) can use a psychic power to give a unit the ability to fire at their usual BS. - Monstrous Creatures have access to a special “Smash” attack, allowing them to halve their attacks, but double their strength. It mentions that this gives them the ability to destroy tanks more easily. - It’s somewhat hinted that AP will have some kind of affect against vehicles. This is because part of the Munitorum dice set includes vehicle damage dice. It specifies that some of the dice are “AP 1, AP 2, and AP 3 Damage dice”, or something to that effect. - 4 Disciplines of Psychic powers, basically what we were thinking in terms of Clairvoyance, Biomancy, etc etc. There’s a chart near the back of the WD detailing which (if any) psychic disciplines a particular army gains access to. It’s interesting to see that a large amount of armies don’t have access to any at all. Also zusammenfassend: fliegende monströse Kreaturen sindso gut wie nicht mehr im Beschuss ausschaltbar, dafür die neue geheimwaffe gegen Fahrzeuge. When the officers of the Imperial Guard pray to the Emperor for salvation, it is for the intervention of his Angels of Death that they beseech him. The Warhammer 40,000 Collector's Edition represents a sacred artifact, a reliquary of the Space Marines over which they invoke the Emperor's divine blessing. Its leatherette exterior features a debossed design of an iron halo and Imperial aquila. Two panels open either side to reveal four gold gilt embossed arched faces, within which are depicted four great heroes of the Space Marines. A secret panel pops open at the top of the reliquary, revealing access to a premium edition of the Warhammer 40,000 rulebook. The pages of this hardback rulebook are made from the very highest quality parchment paper, making it an even greater tome to possess. 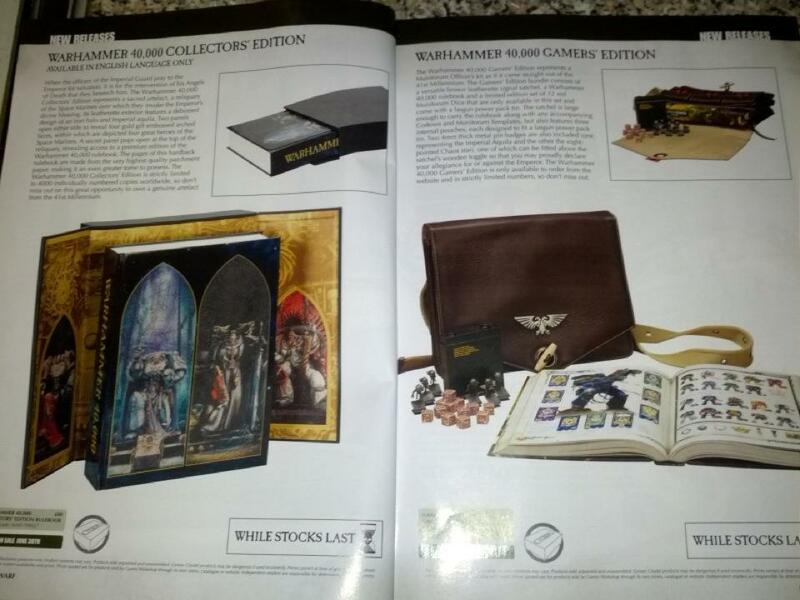 The Warhammer 40,000 Collector's Edition is strictly limited to 4000 individually numbered copies worldwide, so don't miss out on this great opportunity to own a genuine artefact from the 41'st Millenium. The Warhammer 40,000 gamer's Edition represents a Munitorium Officer's kit as if it came straight out of the 41'st Millenium . The Gamer's Edition bundle consists of a versitile brown leatherette singal satchel, a Warhammer 40,000 rulebook, and a limited edition set of 12 red Munitorium Dice that are only available in this set and come with a power pack tin. The satchel is large enough to carry the rulebook along with any accompanying Codexes and Munitorium Templates, but also features three internal pouches. each designed to fit a Lasgun power pack tin. Two 4mm thick metal pin badges are also included (one representing the Imperial Aquila and the other the eight-pointed Chaos star), one of which can be fitted above the satchel's wooden toggle so that you may proudly declare your allegiance for or against the Emperor. The Warhammer 40,000 Gamer's Edition is only available to order from the website and is strictly limited in numbers, so don't miss out."